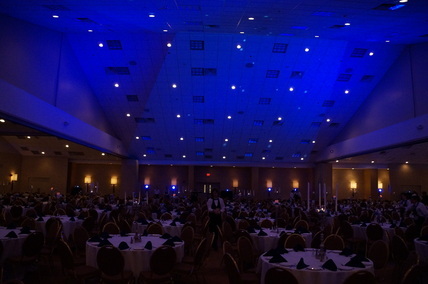 For a holiday party we used blue LED uplighting and projected images of falling snow to create a winter wonderland effect in the ballroom. Frequently the scene behind the stage is very irregular and distracting. Here we used pewter pipe & drape for a unified backdrop. Four LED uplights added some visual depth. Here is an entrance created out of Pipe & Drape for the Ballroom Foyer. Once we add some lighting, the entrance takes on some personality.